Dr. Puneet Goyal is one of the renowned dermatologist in Jaipur who provides Mesotherapy hair treatment in Jaipur. He strongly recommends the procedure as it is safe and relates to hair scalp cleaning. In the procedure, the doctor inserts some medicines like peptides, amino acids, etc. that aids in hair growth. This medicine is injected just below the hair scalp. With the increase in the problems related to hair fall, Dr Puneet suggests Mesotherapy hair treatment. According to him, it improves the circulation under the hair follicles. This in turn gives better nourishment leading to hair growth. As per the doctor, initially the patient will observe the decrease in the hair fall followed by the hair growth. Dr Puneet Goyal states that as such there are no side effects and Mesotherapy gives equal benefit to both men and women hair fall problems. He also mentions that the technique is latest yet the results will vary in patients. Do mesotherapy solve my hair problem ? Yes, Mesotherapy can solve your hair problem. It is a simple treatment in which a medicine is inserted under the hair scalp. Though the growth rate may be different still it will cure the issue. 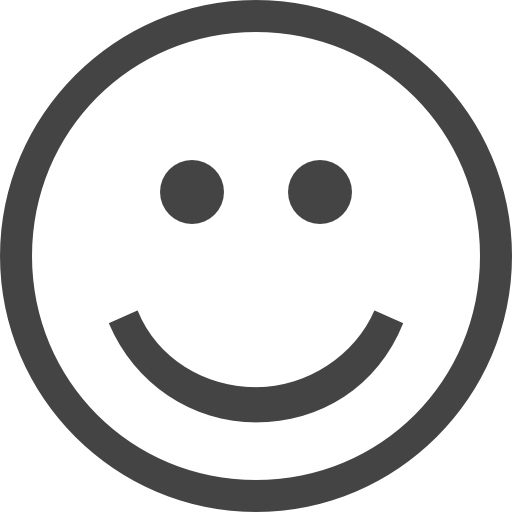 A minimum of 4 sessions can help but depending on the patient a maximum of 10-12 sessions can be taken. What is the cost for hair Mesotherapy Treatment in Jaipur? It depends on the condition of the patient. 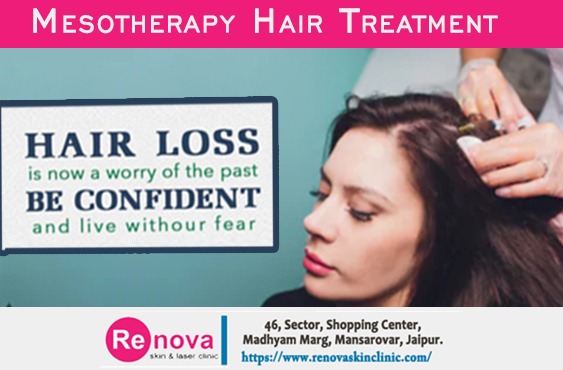 You may contact Dr. Puneet Goyal to know more or visit the Renova Hair & Skin Clinic. Not as such. It is the patient’s perception also. In case of inconvenience, a pain relieving ointment is given to the patients. Are there any potential risks with the Mesotherapyfor Hair Loss? The Risks are minimal if you take it from the well trained Doctor Puneet Goyal. Mesotherapy may just cause nausea, pain, swelling and itching in some patients. My expectations from theMesotherapytreatment in Jaipur!! You can expect quite well from the Mesotherapy Treatment. It will first curb the hair fall and then assist the hair growth. What is the recovery time for Mesotherapy Hair treatment? 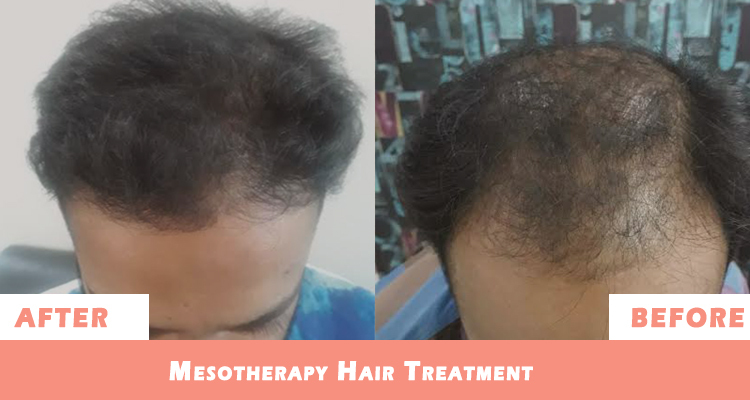 Mesotherapy is a non invasive treatment and hence as such do not require a recovery time..
Who are ideal candidate for Mesotherapyfor hair treatment? Both men and women can undergo treatment who suffers with Progressive Baldness, Patchy Hair Loss, and Progressive Thinning of Hair. Meet the doctor well in time as he may prescribe you to avoid some non-steroidal anti-inflammatory drugs one week before the treatment. •	Avoid washing hair for at least 8 hours after the treatment. •	Do not exercise at least till 8 hours as it can cause sweating in the scalp. •	Drink water as prescribed by your practitioner. •	Apply gels (as prescribed by doctor) in case of swelling. Yes, you can wash your hair but only after 8 hours of the treatment. Yes, the treatment goes same in both men and women. Will Mesotherapywork on a fully balding area? Yes, it can work and help in hair re-growth. When Mesotherapyis recommended and is it better option as compared to others? Mesotherapy is recommended when you observe unusual hair fall that leads to partial or patchy baldness or may be thinning of hair. Yes, it is a better option as it is safe, non surgical, painless, simple and comfortable. As such no pre or post precautionary measures to be taken unless specified by the doctor. Mesotherapy treatment for hair goes perfectly and feeling very good the treatment. All Thanks to Dr. Puneet Goyal & Team. Booked for Hair falling problem on front side, Counseling done by Dr. Puneet Goyal satisfied me and mesotherapy he suggested me gone successful.